There are several different aids for sleep apnea, and one of the more popular ones are sleep apnea mouthpieces. These devices are useful for those who suffer mostly from mild or moderate sleep apnea. For some patients, using a mouthpiece may remove the need to use a CPAP machine! What is a sleep apnea mouthpiece? Obstructive sleep apnea is often caused by blockage of the airway as a result of the soft tissues of throat collapsing or the tongue rolling into the back of the mouth. So one of the logical ways to treat sleep apnea is to prevent the blockage of the airway to start with. 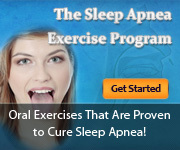 This is where a sleep apnea mouthpiece can help. Sleep apnea mouthpieces are devices that push the lower jaw and tongue forward so that your airways are kept open. There are generally two types of sleep apnea mouthpieces, namely tongue retainers and mandibular repositioning devices. Mandibular repositioning devices are generally more popular, as some of them can also help reduce or stop snoring. The device fits into the mouth like dentures, and pushes forward the tongue and jaw. That being said, some people say that tongue retainers are more effective for sleep apnea; the downside is that tongue retainers can be difficult to keep in the mouth all night long and tend to prevent breathing through the mouth. There have been a number of studies that have been done to test the effectiveness of mouthpieces for sleep apnea. Some of the major ones have been highlighted below. In this study, 44 patients were given a mandibular repositioning device (MRD) to use for one night. Sleep studies were carried out before and during use. It was found that the device significantly helped patients with mild sleep apnea, and offered some assistance in patients with more severe sleep apnea. Snoring was also found to be subjectively reduced. 134 patients were first involved in the study, but only 75 made it to the final polysomnography (sleep study). All patients were giving an adjustable MRD to use for 4 weeks. At the end of the study, it was found that usage of the MRD helped reduce apnea occurrence by around half and reduced the number of times the patients woke up at night. There was also a reduction in snoring in most patients. A final follow up was made a year after the last sleep study, and it was found that around 86% of the study’s participants continued using device. 20 participants with mild to moderate sleep apnea were made to use a MRD and a CPAP machine, each for 6 weeks (not simultaneously). The results of the sleep studies of these participants showed that both devices helped with the patients’ sleep apnea, but respiratory patterns became normal after 6 weeks mostly when the CPAP machine was used (70%). However, compliance with the MRD is better than the CPAP, since it is more comfortable to use. These different studies all came to the conclusion that there is a high possibility that mouthpieces can be effective as a form of treatment for mild or moderate sleep apnea. Most patients agree that using a mouthpiece is much more comfortable than using a CPAP machine, and this alone is one of the reasons mouthpieces are effective for long-term compliance. The FDA has approved more than ten types of mouthpieces for the treatment of sleep apnea, and different patients choose different mouthpieces. The variety of mouthpieces in the market is definitely good since this means a sleep apnea patient can always try another design if one design isn’t very suitable. If you aren’t sure about which mouthpiece to first try, the reviews below of the most popular brands in the market can help you make up your mind. All the mouthpieces below are FDA-approved. The Good Morning Snore Solution is one of the most effective mouthpieces for snoring out there. Its unique design allows the tongue to remain pushed forward throughout the night, preventing blockage of the airway. It is a pretty simple-looking device but it works. The simple plastic composition of the Good Morning Snore Solution makes it not only easy to use, but also comfortable to sleep with. It may mainly be marketed for snoring, but there is some evidence that it may help for mild to moderate sleep apnea as well. The only downside of the device is that it keeps your mouth sealed completely through the night, so you will have to be comfortable breathing through your nose. If you have sinus problems or cannot breathe through your nose all night for some reason, this device is not recommended. The SleepPro line of devices are mandibular advancement devices (MADs) that are easy to use. The simplest and cheapest device, the SleepPro Standard, is a boil-and-bite device that was the original product of the company. Since then, there are other products that have been developed, namely the SleepPro Custom, SleepPro Self-Fit Adjustable, and SleepPro Chin Support Strap. The SleepPro Custom is a device made specifically for the individual patient, while the SleepPro Self-Fit Adjustable is a device that has seven different settings for variable advancement. Lastly, the SleepPro Chin Support Strap is a device that is worn on the chin rather than in the mouth. For mild or moderate sleep apnea though, the last device may not be suitable. Users find that the device is comfortable once you get used to it, and the technology behind moving the jaw forward has long been thought to be effective to open the airway when sleeping. The VitalSleep mouthpiece is another boil-and-bite mouthpiece that pushes the jaw forward, similar to the SleepPro mouthpiece. All you have to do to use this device is place it in boiling water to 10 seconds and then place it into your mouth with your jaw protruding forward. One of the main advantages of VitalSleep is that it is affordable compared to if you get a custom device fitted by a dentist. Many users find that after some time, it is easy to get accustomed to the device. Click here to learn more about the VitalSleep mouthpiece. As with the previous two mouthpieces, the SnoreRx is also a boil-and-bite MAD. However, it is more customizable as the mouthpiece can be adjusted in 1 mm increments and also has a locking system which locks the device in place once you have adjusted it to perfection. The SnoreRx mouthpiece meets the new standards by Medicare, and also causes minimal side effects due to its customizability. If you give yourself some time to get used to wearing the device, you may find that it is an excellent device. We hope the information given here has helped you learn how mouthpieces can help sleep apnea, and what some of the popular brands out there are. The only way to know if a mouthpiece is suitable for you and if it will help with your sleep apnea is by trying it out. However, if you are using a CPAP machine, do not stop use without first consulting your doctor.